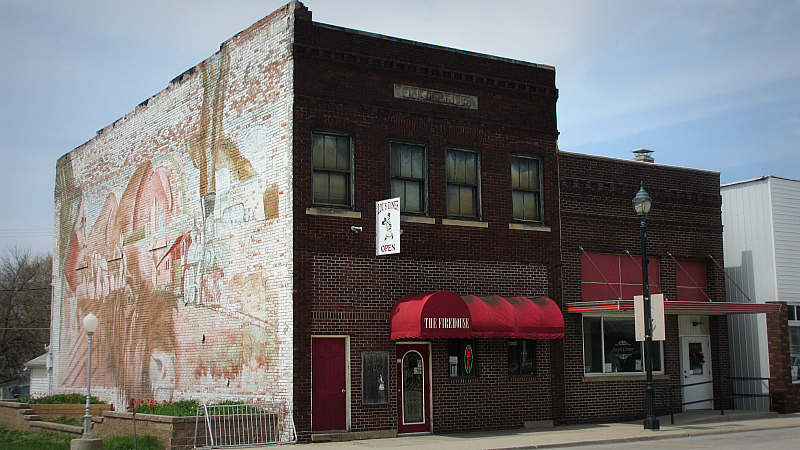 Lou's Diner is in a historic building that was once the city hall of Woodward and was home to a pizza restaurant until 2001. 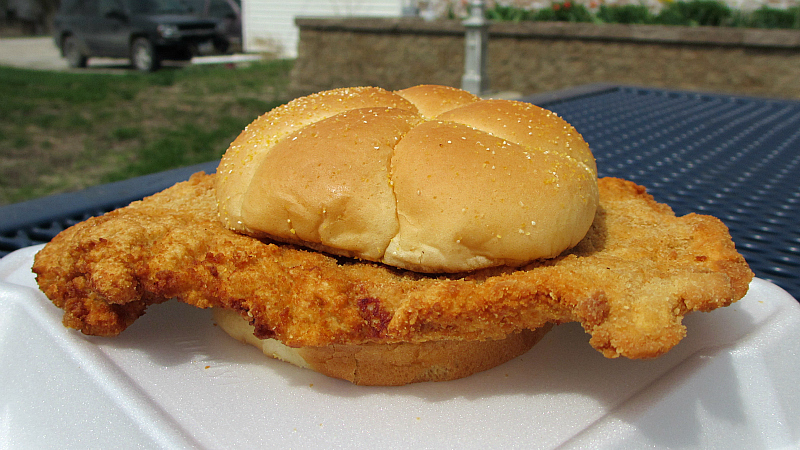 Lou's won a plaque as first runner up in the 2005 IPPA Breaded Pork Tenderloin contest, so any trip through Woodward is incomplete without stopping here. Location: 220 S. Main St in Woodward, Dallas County, Central Iowa. Directions: This is just down the street from my last stop. Woodward is about twenty minutes north and west from Des Moines. 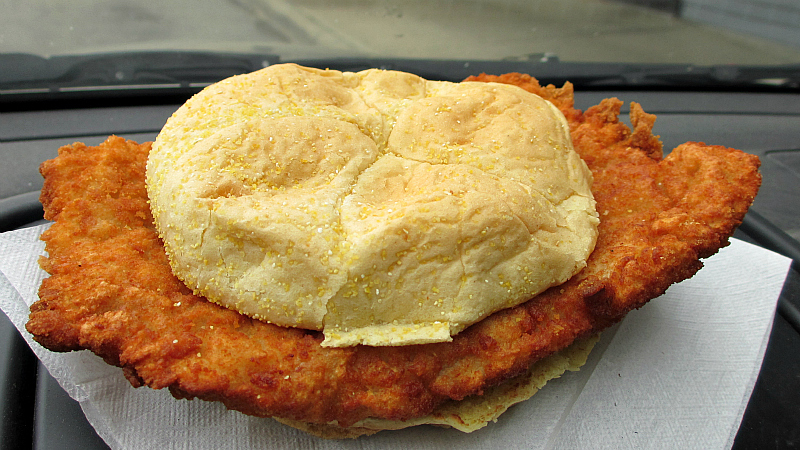 The Tenderloin: This sandwich completely filled the to-go box each time I have come here. The shape was a classic butterfly cut which had been pounded out to a huge width. I tasted very little seasoning in the crunchy breading. 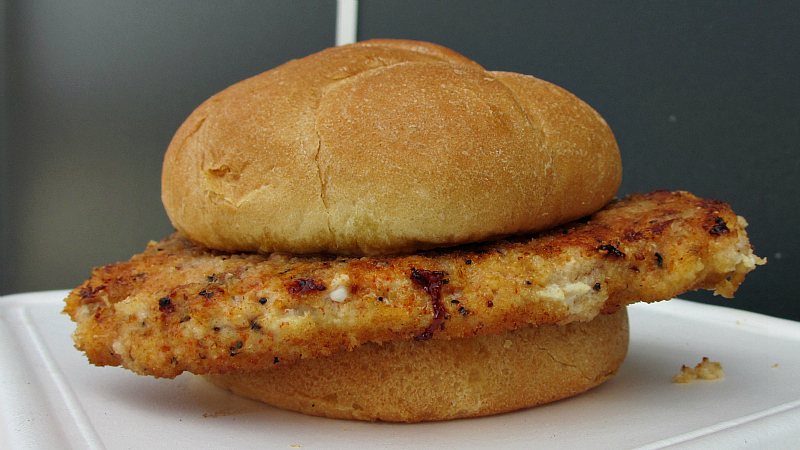 Served on a buttery toasted kaiser bun. Overall 8.1 out of ten. Also on the menu: The menu is big with a full breakfast selection and homemade pies and handmade onion rings as the highlights. Service: There was one old lady waiting tables and another cooking when I stopped in. I think they get busy for breakfast. Ambiance: This old building has been renovated and reused in many different ways over the years. The kitchen is open, but some supplies are kept in the dining area. There are two dining areas and a bar, and the walls are covered in farm themed decor. Final Thoughts: I don't think I've heard a single word about Lou's since they won their IPPA plaque eight years ago. They just seem to be going along on local business and doing just fine. Cayenne's Cafe is named for a pepper and seems to be one of the younger businesses on Main St. in Woodward. 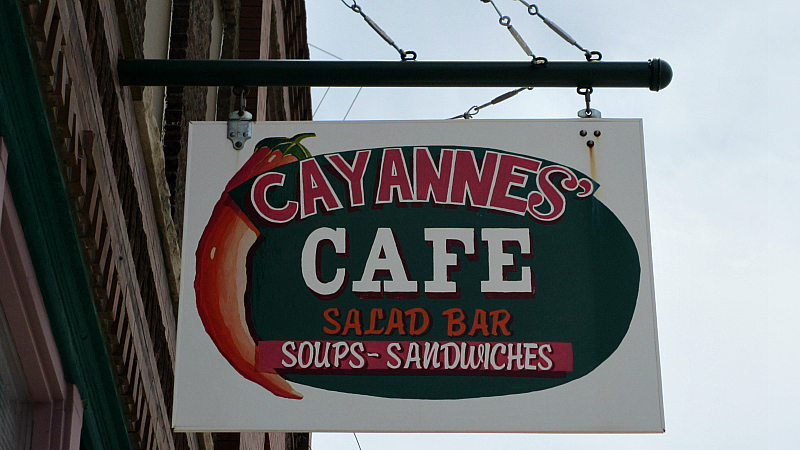 Judging from the hanging banner behind the bar I get the idea Cayenne's sells prime rib sandwiches when the High Trestle Trail Bridge opens for the summer. 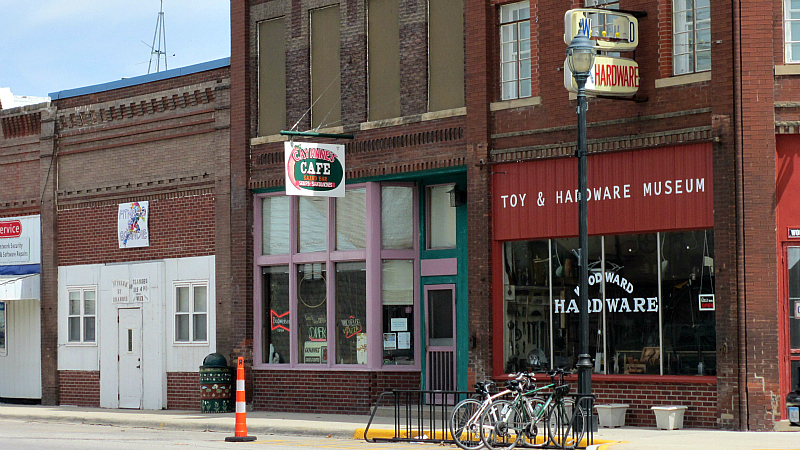 Location:121 S Main St in Woodward, Dallas County in Central Iowa. Directions: You take Highway 141 north from 80/35 and turn north at Highway 210 which turns into Main St in Woodward. 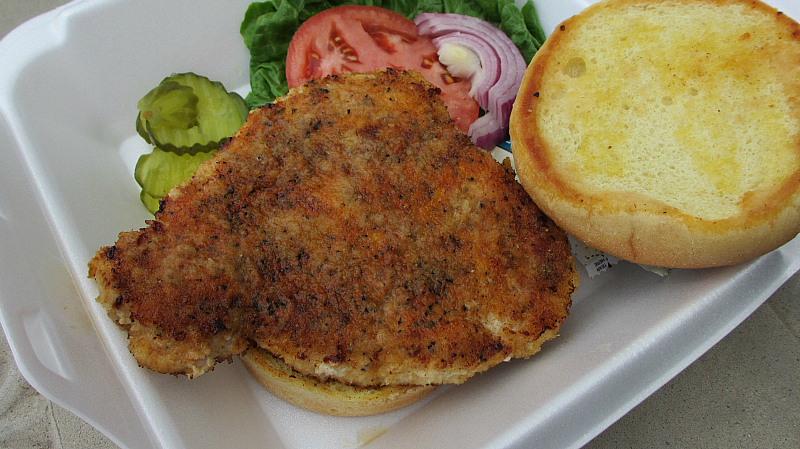 The Tenderloin: This is described as a breaded tenderloin on the menu, but its a very unusual one. It doesn't appear to be deep fried, and there are no deep fried items on the menu so they probably don't have a fryer. 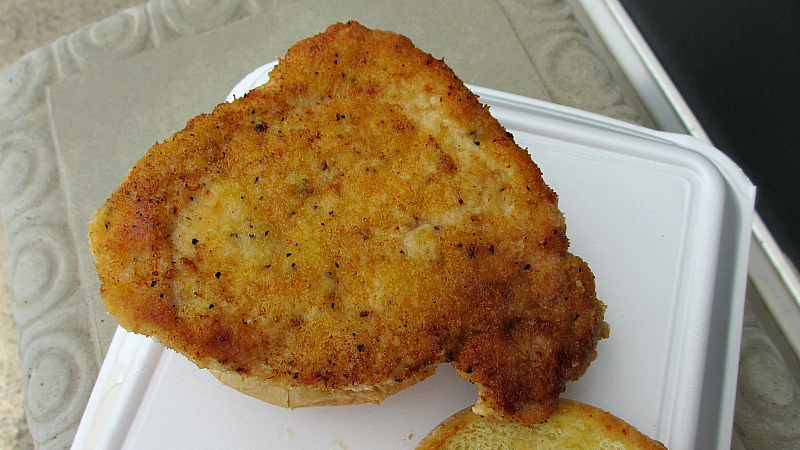 The pork loin meat is breaded with a little bit of crumbs and a lot of spices. Not anything hot, just a lot more from the spice rack than I am used to. One side of the loin was golden brown while another was orange. 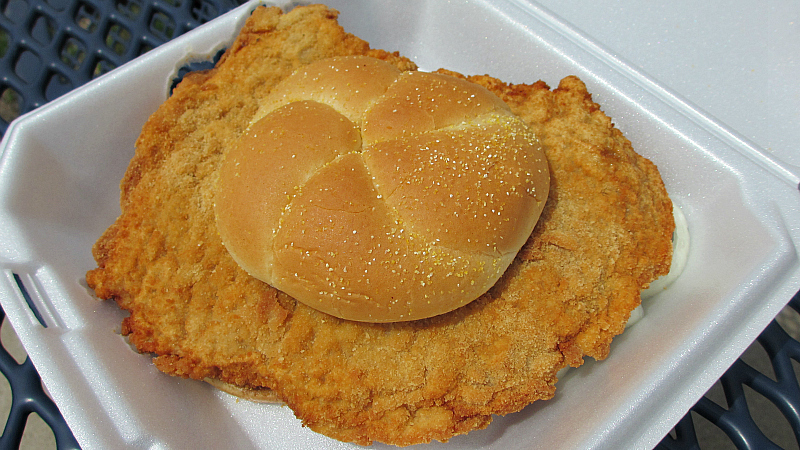 The juiciness of the loin meat meant a lot of steam got into the breading and made a wet orange layer that stuck to the bun. This was close to being something tasty but there just wasn't any crunch to go along. Served with all the fixings on a toasted bun. Overall 7.0 out of ten. Also on the menu: the sign tells people of a salad bar and deli sandwiches. There is also pizza, a frito pie, and a breaded hamburger. Service: I came in and just one person was working tables while another was cooking. Ambiance: This is a restored main street building with high ceilings and an old bar and open kitchen. There are tables for seating and cayenne pepper decorations hanging from the lights. 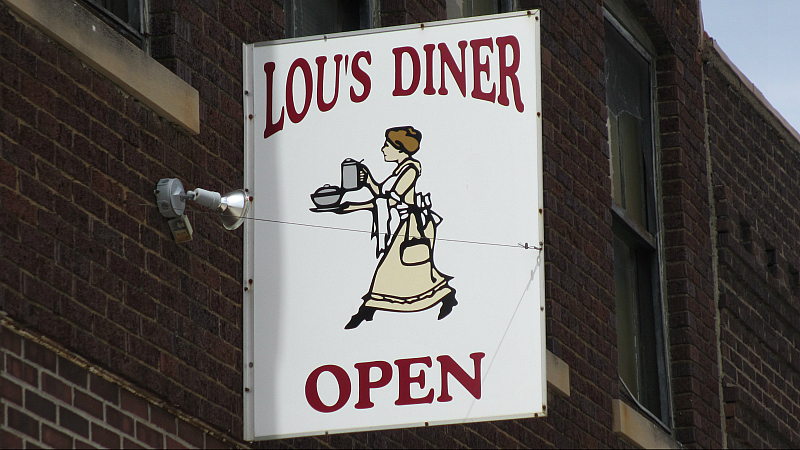 Final Thoughts: My next stop in Woodward will probably be just south on Main St at Lou's Diner.